Nano Shine is the Australian Distributer of Ceramic Pro products by Nano Shine Ltd.
Nano Shine is a manufacturer of industrial multifunctional protective coatings for all surfaces, originally devoted to the OEM Industrial Coating Field. In 2010 the brand Nano Shine was started with a series of products for the consumer automotive market “Ceramic Pro”. 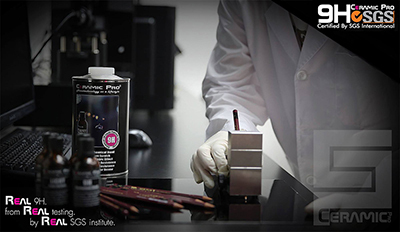 Ceramic Pro is based on ceramic molecular compounds (nano-ceramics). The Ceramic Pro series of coatings are unique surface protection products for cars, marine and air transport; it is also used in construction, industrial and household applications. Ceramic Pro coatings are used for paint, metal, plastic, glass, leather and rubber surfaces. The Ceramic Pro range are formulated by a qualified chemist with a high level of experience in the industrial protective coating field. Ceramic Pro has been specifically formulated for Automotive substrates and is always undergoing extensive testing for new and improved versions to take the coating industry to new levels. Ceramic Pro are trusted by Carlsson Asia, and also ecurie25 in Australia to protect their $8+ million dollar Exotic Supercar Collection. The Ceramic Pro 9H Permanent Paint Protection coating is an “Above 9H” rated coating with superior Chemical Resistance, Super-Hydrophobic Effect, UV Resistance, Scratch Resistance, Temperature Resistance and Corrosion Resistance. Nano Shine Industrial Division release the Ceramic Pro range of protective coatings for Automotive, Marine and Air. Official SGS Certification of Ceramic Pro Products. Nano Shine Industrial Division contracted with Russian Military Aircraft Manufacturer and Oil Pipe Lines for Industrial Coatings. Release of Ceramic Pro Textile (Super-Hydrophobic Textile Coating). Partnership with ecurie25 – The World’s Largest Exotic Supercar Collection. Ceramic Pro on display at Top Gear Festival Australia with a new Lamborghini Performante. Release of the new 9H Permanent Coating. Ceramic Pro on display at Top Gear Festival Australia with a Ferrari 360 F1 CS. Ceramic Pro enters the Aviation Industry.